Some poems in Icarus inhabit a world of private and personal events and memories, many of which are written about in epigrammatic structures using freshly-minted and freely-associative imagery. Others make reference to Biblical and classical personages and events (Solomon, Achilles, Troy, and Icarus in the imaginatively-perceptive title-poem). This collection also studies recent cultural icons (St Therese of Carmel, Marilyn Monroe, and Lech Walesa) and the worlds of artists (Breughel, van Gogh, Klee, Giacometti, Callum Innes, and Cezanne visiting Pissarro) in which the descriptions of the painter’s craft, dedication and insights are used to illustrate and illuminate the everyday… all skilfully and sensitively described with exact verbal precision and rich diction. The writing throughout the collection is confident and authoritative. There is a tone of hushed questing and questioning, of probing boundaries beyond the reach of secretiveness. This is an intriguing and satisfying collection, whose treasures are revealed by careful and repeated readings. 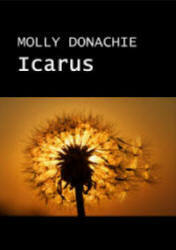 Molly Donachie is a native of Dundee but has been resident in Edinburgh since 1986. She is a graduate of the University of St. Andrews and of the University of Edinburgh and holds degrees in Scottish law and the History of Art. 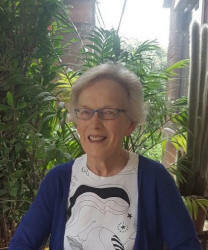 For many years, she worked as a solicitor across all areas of civil law in both the public and private sectors in Scotland. She latterly specialised in all aspects of the legal work of large sporting estates and family farms etc. Her poems have appeared in several publications including: Poetry Life; The Frogmore Papers; Blinking Eye Publishing; Northwords Now.